We at H2OSE take great pride in taking that extra effort to respecting your gardens and property. No size 12 footprints in your flowerbeds! 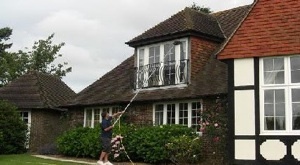 Rest assured H2OSE are very experienced window cleaners. We pride ourselves on reliability, professionalism and no matter what size of property you live in we will make sure you have your windows cleaned at a frequency that suits you. We use the latest in Pure Water Cleaning Technology. No climbing on your tiles or porches.